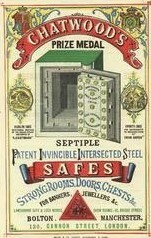 One of the exhibitors at the Exhibition, Silas C.Herring, Safemaker of New York, placed a notice on his Bankers Safe challenging any other safe exhibited. This was taken up by Samuel Chatwood on condition that only conventional safe breakers appliances would be used. 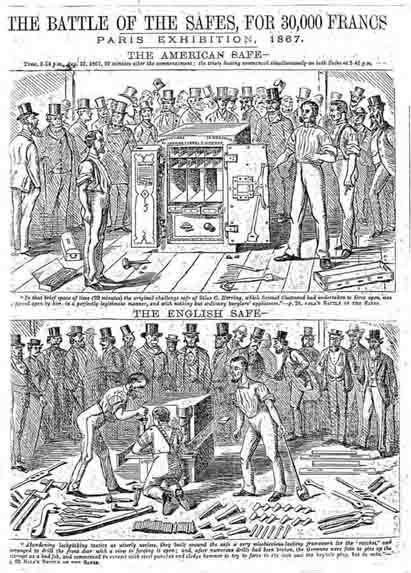 On the day of the test Chatwood's men brought such tools including hammers, wedges, and a sectional bolt-together jemmy. Herring, who for reasons unknown, had engaged German operatives, brought a massive array of tools including a screw frame with ratchet drill, 20lb.sledge hammer, 20lb.steel wedges, and six foot long crowbars weighing in all a total 469 lbs. For their part, Chatwood's tools only weighed 145 lbs. The adjudicators had Herring's total reduced by half but still retaining the tools mentioned. Between the time of the agreement and the date of the test, Herring appended a codicil to the effect that the subject of the attack was to be the small internal chest. Chatwood had not expected to have to open two safes, only the one to which the challenge had been attached. The committee however, which comprised two Americans, two Englishmen, a French non-English speaking chairman and an American secretary/interpreter and it was decided that the test should proceed, even with everything being weighed in the favour of the Americans. It was probably Samuel Chatwood's ego which made him accept the situation when general opinion was in favour of the challenge being cancelled and even that Chatwood should be awarded the prize without the test having to take place. The test began at two forty-five p.m. and lasted for five hours with a brief interval for refreshments. The Germans aborted their lock-picking tactics in favour of an attempt to drill through the door. The screw frame and drill were attached but they were unable to penetrate the 'intersected' steel. After many drills were destroyed they abandoned the door and tried to open up a corner joint at the front of the body bu t this also failed. Eventually they employed their heaviest wedges, 'cold setts', and the 20lb. sledge hammer to cut open the dovetail joint on the right hand side of the safe. With the aid of the six foot crowbar, they exposed a sufficient area of the protection to eventually smash a hole into the interior of the safe large enough to admit the 'parallelepiped' or test block. The time taken was 232 minutes. Chatwood's operatives - his own employees - began by wedging along the mid-meeting point of the doors (it was a double-door safe). Within 29 minutes they had opened both doors. In other words they had forced open the original safe as specified in Herring's published challenge with nothing other than ordinary burglar's appliances in less than half an hour. They then had the task of applying themselves to the inner chest, or coffer, which, being enclosed within the main body of the safe and underneath shelves, cupboards, and partitions, was, as Chatwood himself stated, " not well be got at". They then set about wedging the triple walls of plate which they succeeded in doing to the extent that an opening was created which permitted a hand to remove any contents. This however was not sufficiently large to admit the test block. As the hour was now late, the committee decided that the test should be carried over until the following morning despite the fact that a few more blows would have completed the job. Within four minutes of restarting they had completed the total removal and destruction of the front of the Herring chest. The total times were, for the safe as challenged - 29 minutes. For the chest - 225 minutes, making a total time of 254 minutes. Herring's attack on the Chatwood took 232 minutes. The judgement took place at two meetings of the Americans and French without the knowledge of the two English arbitors who it appears had previosly withdrawn on their discovery after the test that Herring's drawings, submitted along with Chatwood's beforehand, contained serious errors and omissions of a character designed to mislead Chatwood and his men. Furthermore it was revealed that the American committee members had, in their absence, been in improper communication with M.Douliot, the chairman, whose utter ignorance of the English language placed him entirely at their mercy. The judgement however was in favour of Herring. At a subsequent Tribunal of First Instance in Paris the following year, the above judgement was declared null and void, with Herring having to bear the costs. The Chatwood safe tested was the Septuple Patent in which the filling between the dovetailed 1/2" plates was probably of haematite iron and more prone to shattering than the 'spiegeleisen' which was patented in 1868 and incorporated in the Octuple Patent, which was still a square dovetailed body and with sliding claw boltwork. The specification is described under the catagory of List 8 in the year 1880 and it is mentioned that it is superior to the 1867 version of the Paris test.